Vincent Van Gogh! The name is a legend in the world of art. Whether it is his masterpieces of art work or imprints of his exceptional work on gifts, Van Gogh always rides on the wave of popularity. Today, more than ever before, artworks of Van Gogh, Monet, and Klimt are the favourites of virtual art connoisseurs and collectors. At the heart of their artwork lies a challenge as well as a stimulation that people across the world are able to feel through their paintings. Their paintings reveal more than the eye can see, the mind can judge, and the heart can feel. Of all painters across the world, Vincent Van Gogh has always stood supreme! Why is Van Gogh’s Art so special? Vincent Willem van Gogh was born in the South of Netherlands and is one of the greatest Dutch post-Impressionist. Van Gogh’s artwork is notable for its emotional honesty, rough beauty, and bold colours These are some of the reasons why his art has a deep influence on modern day art as well as 20th-century art. Unlike Gustav Klimt, who was an Austrian symbolist painter, Van Gogh paintings revolved around proper shapes and sketches. His work includes landscapes, portraits of cypresses, self portraits, still life, and paintings of cypresses, sunflowers, and wheat fields. Most of his artworks reveal Impressionist as well as Neo-Impressionist techniques. Remarkably so, he produced over 2,100 artworks and this consisted primarily of 1,300 watercolour paintings, sketches, drawings, and prints as well as 860 oil paintings. Flowers: Van Gogh has created several artworks depicting landscape with flowers. Flowers have a soothing effect on the mind and hence these paintings have become highly popular. The most famous paintings in this category include View of Arles with Irises (1888), a series of Sunflowers paintings including Roses and Sunflowers (1886), and Irises (1889). Flowering Orchards: This is a series of paintings by Van Gogh and is often referred to as the “Orchards in Blossom” paintings. There are 14 paintings in this group and they depict the joyous, optimistic, colourful and visually expressive moods of springtime. These paintings have been reprinted and used in Christmas gifts and holidays gifts across the world. The most famous paintings in this category include View of Arles, Flowering Orchards (1889), Flowering peach trees (1888), Peach Tree in Blossom (1888), and The Cherry Tree (1888). There is something delicately sensitive about the paintings in this category. Wheat fields: Van Gogh during his period travelled afar. He was known to make painting excursions during his visit to the landscape in and around Arles. He created several paintings that primarily features wheat fields, harvests, and various rural landmarks of Arles. Van Gogh had mentioned in one of his letters that while creating these paintings, he had got completely immersed “in the immense plain against the hills, boundless as the sea, delicate yellow”. The most popular paintings in this category include The Old Mill (1888) and Wheatfield with Crows (1890). What makes these paintings reach out to the people is the expression of extreme loneliness and melancholy. This category of artwork has been used extensively on clothing and especially on silk scarves and other fashion gift. Cypresses: This is one of the most popular painting series by Van Gogh. The paintings in this category are characterized by an artistic technique comprising of densely painted impasto and swirls. Using these techniques, he produced one of his best known and most popular paintings called The Starry Night (1889). Some of the other prominent works from his Olive Trees series include Cypresses (1889), Alpilles in the Background (1889), Olive Trees in a Mountainous Landscape (1889), Women Picking Olives (1889), Wheat Field with Cypresses (1889), Cypresses with Two Figures (1889–1890) and Road with Cypress and Star (1890). The cypresses have become synonymous with a stylistic uniqueness that only Van Gogh could have produced. These ever popular paintings have been used across the world in several ways but most popularly kept alive through gifts. Some of the popular Christmas gifts that adorn his paintings include books and multimedia, reproductions on glass, canvas, and cloth, posters, magnets, and personal accessories. Vincent Van Gogh has also created several Self Portraits and Portraits during his lifetime, which has been reproduced in the form of birthday gifts or Christmas gifts. Some of his famous paintings include Self-Portrait (Spring 1887), Self-Portrait (September 1889), John Peter Russell (1886), Paul Gauguin (1888), Portrait of the Art Dealer Alexander Reid (1887), Mother by a Cradle, Portrait of Leonie Rose Davy-Charbuy (1887), Portrait of Père Tanguy (1887-88), Agostina Segatori Sitting in the Café du Tambourin (1887), and Portrait of the Postman Joseph Roulin (1841-1903) among others. 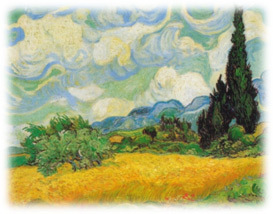 Here at WomenClothingToday.com we drive our inspiration from Van Gogh’ masterpieces too. Whether it is a beautiful silk dress, a scarf or a shawl, or even tunics and kaftans; Van Gogh’s art lives, breathes, and comes alive in a myriad of colours on our silk garments.